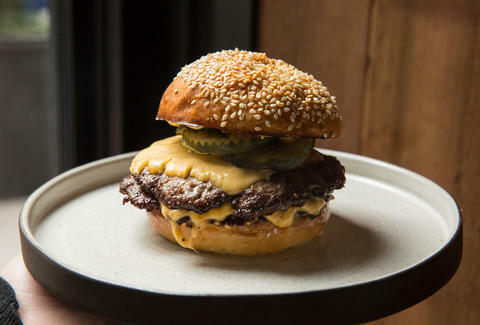 Salvation Burger, the fast-casual, high-end burger joint run by The Spotted Pig’s April Bloomfield, has officially reopened, following a devastating fire that “severely damaged” the kitchen and forced the restaurant to shut down back in May. The restaurant, which had only been open since February 2016 at Midtown’s Pod 51 hotel, is known for its gourmet (and pricey) burgers made with grass-fed, house-butchered beef, which will now come from Bloomfield’s recently opened White Gold Butchers. Returning to the small menu are the popular Classic and Salvation Burgers (the former inspired by Bloomfield’s beloved Five Guys), in addition to a veggie burger, house-smoked hot dog, fish sandwich, fries, and salads. For dessert, boozy and traditional milkshakes are available as well as inventive pies like a Caramel Popcorn Ice Cream Pie. Wine, beer, and cocktails are also an option to pair with your fancy Salvation Burger topped with taleggio and caramelized onions. See you on the (inevitable) line! Ciera Velarde is an editorial production assistant at Thrillist who is wondering if it’s OK to order a veggie burger, fries, milkshake, and pie in one sitting. Asking for a friend. Follow her on Instagram.